Bengalis are fond of fish. You can find various kinds of fish along with many unique recipes which you may cook using those fishes. 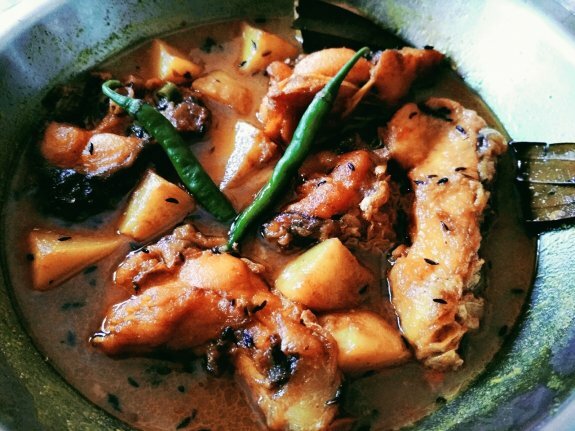 Katla Macher Rasa is a very popular Bengali dish which is really tasty and mouth-watering to have. So, make this Bengali traditional dish Katla Fish Rasa without onion in a different yet absolutely delicious style. 1. Cut the fish into equal pieces and wash it properly. 2. Now marinate the fish pieces with turmeric powder and salt and keep it for 5 minutes. 3. Now heat oil in a Kadai and fry each fish pieces in medium heat. Remember medium fry the fish pieces until light brown in colour. Don’t deep fry it otherwise the fish may become stiff. 4. Take another pan and heat 6 Tbsp of oil. Lightly fry the potato cubes and keep it aside. 5. Now, add cumin and whole dry red chilly into the oil. 6. Add the chopped tomatoes and sugar and fry it until the tomatoes become soft. 7. After that add cumin paste, coriander paste, green chillies paste, salt and turmeric powder. Mix everything well and cook for 1-2 minutes. Add red chilli powder and mix again. Cook for another 2-3 minutes or until the oil comes out from the side of the Masala paste. 8. Now add the fried potatoes and mix well with the Masala paste. Cook for 1-2 mins. 9. Add warm water and cover it. 10. When it starts boiling, add the fried fish pieces one by one in the Jhol or Rasa. 11. Cook for 4-5 minutes more. Check the taste of the Rasa whether salt, sugar and chillies are perfect or not. 12. If anything is required, you can add, mix this and cook for 1 min more. 13. Remove it from heat and serve hot with rice.